Sleep bruxism, a well-known burden for dentists, is commonly observed in pediatric populations. Dentists are responsible for the detection and prevention of the detrimental consequences on the stomatognathic system that may occur in some patients with sleep bruxism. However, sleep bruxism is much more than tooth wear, since it is frequently associated with orofacial pain, headaches, and other more severe sleep disorders, such as sleep-disordered breathing. Although the mechanisms underlying the possible interactions among sleep bruxism, headaches, and sleep-disordered breathing need further research, these conditions are often concomitant. A literature search was performed to identify relevant publications related to the topic, which have been integrated in this topical review. The aim of this article was to provide a brief overview on sleep bruxism, headaches, and sleep-disordered breathing in pediatric patients and to promote a multispecialist approach (including dentists, sleep specialist physicians, and psychologists) in the diagnosis and management of these frequently associated disorders. Zhao, Nan Nan / Whittle, Terry / Murray, Greg M. / Peck, Christopher C.
Aims: To determine whether mucosal pain, evoked through a novel topical capsaicin model, has an effect on jaw movement and whether psychologic factors have an association with any pain-induced movement effects. 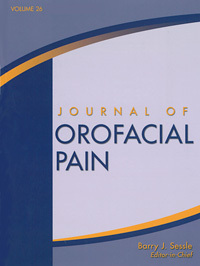 Methods: Mandibular movement was recorded from 26 asymptomatic subjects during free opening and closing, resistant opening jaw movements, and free and standardized chewing, at baseline and in test sessions while the subjects were wearing a custom maxillary mouthguard coated with either capsaicin cream (pain group, 13 subjects) or placebo cream (control group, an additional 13 subjects). All subjects completed the Depression Anxiety Stress Scales (DASS) and the Pain Catastrophizing Scale (PCS). Statistical analyses were made with independent t tests and bivariate correlation analyses. Results: Capsaicin induced moderate pain in the pain group, but there were no significant differences between the two groups in the change of kinematic variables from baseline except for a significantly greater increase from baseline in the number of chewing cycles per second (chewing rate) for free (t = 2.74, P = .011) and standardized chewing (t = 2.10, P = .047) in the pain group compared with the control group. In the pain group, the DASS anxiety score was negatively correlated (r = -.70, P = .007), with the change of mean opening velocity from the baseline to the test session in the free opening task, and the DASS depression score was negatively correlated to the increase of chewing rate in the free chewing task from the baseline to the test session (r = -.56, P = .046). Conclusion: Capsaicin-induced mucosal pain resulted in a significant increase in chewing rate but had no effect on amplitude or velocity in opening/closing jaw movements and chewing. Anxiety and depression scores correlated negatively with velocity in free opening jaw movement and chewing rate, respectively. Aims: To compare patients with combined tension-type headache and myofascial temporomandibular disorder (TMD) with control subjects on two measures of central processing-ie, temporal summation and aftersensations to heat stimulation in the trigeminal nerve and spinal nerve territories. Methods: A novel heat stimulation protocol was used in which 13 females with tension-type headache/TMD and 20 female controls were exposed to 11 painful heat stimuli at a rate of 0.33 Hz. Two temperature ranges (low, 44°C to 46°C; high, 45°C to 47°C) were tested on the cheek and arm in separate trials. Perceived pain was rated on a 100-mm visual analog scale after the second, sixth, and eleventh stimulus presentation and every 15 seconds after the final stimulus presentation (aftersensations) for up to 3 minutes. The duration of aftersensations was compared using the student unpaired t test with Welch correction. Results: Temporal summation was not observed in any of the groups, but aftersensations were consistently reported. The aftersensations lasted longer in tension-type headache/TMD patients (right cheek, 100.4 ± 62.0 seconds; right arm, 115.4 ± 64.0 seconds) than in controls (right cheek, 19.5 ± 2.5 seconds; right arm, 20.3 ± 2.7 seconds) (P < .05). A cutoff value (right cheek, 44.6 seconds; right arm, 41.5 seconds) provided a sensitivity and specificity of 0.77 and 0.95, respectively, with the high stimulus protocol. Conclusion: The results from this pilot study suggest that aftersensations to painful heat stimulation can appear without temporal summation. Furthermore, the developed test protocol has a good predictive value and may have the potential to discriminate between tension-type headache/TMD patients and control subjects. Aims: To use a range of evaluation instruments to assess the content and quality of websites about temporomandibular disorders (TMD) and thereby provide guidance regarding the actual accuracy and comprehensiveness of the information of the sites. Methods: Sixty-seven websites resulting from an Internet search with the word "TMD" were evaluated using Journal of the American Medical Association (JAMA), DISCERN, and Health on the Net (HON) criteria, along with an evaluation method to assess the scientific quality of the website contents. Results were compared according to reviewer, website type, and presence of HON seal. One-way analysis of variance (ANOVA), Student t test, chi-square test, and Pearson correlation analysis were used as appropriate. Results: The mean content, HON, and DISCERN scores were 38.9%, below 50%, and 53.9% of the maximum possible score, respectively. Fewer than 50% of the sites displayed the author or reference of the information according to the JAMA benchmarks criteria. Every evaluation criteria showed good agreement among reviewers. Commercial websites were the most common, while sites of nonprofit organizations showed the highest content scores. The overall quality was poor to moderate for all website types. Conclusion: Sites concerning TMD were poorly organized and maintained. Also, most sites contained insufficient or scientifically incorrect information that could have a negative effect on the treatment outcome and prognosis of TMD. Clinicians should guide patients to reputable sources of information that will enhance patient comprehension and better treatment outcomes. Aims: To investigate the perceived impact of oral health-related quality of life problems in individuals with Ehlers-Danlos syndrome. Methods: Members of the Swedish Ehlers-Danlos Syndrome Association completed the Oral Health Impact Profile (OHIP-14). Of the 250 participating individuals, 223 were women, and they were the main focus of the analyses. The results were compared with a previous study of the oral health impact on quality of life in the Swedish population. Statistical methods used for comparison were the Student t and chi-square tests. Results: The mean OHIP-14 value for the entire Ehlers-Danlos syndrome group was 11.1. The mean for women was 11.8, which was significantly higher than 6.8 of the comparison group. The OHIP-14 score varied among age groups, and the highest mean value was found in the age group between 56 and 65 years of age. The most statistically significant differences between the subjects with Ehlers-Danlos syndrome and the comparison group were found for OHIP items 3, 4, and 8: "I have had pain in the mouth," "I have had discomfort when eating," and "I have been forced to interrupt meals." Conclusion: It is well-known that Ehlers-Danlos syndrome has a considerable impact on healthrelated quality of life, and this study is the first to reveal that women with Ehlers-Danlos syndrome report a low oral health-related quality of life as measured with the OHIP-14. Dimensions that were particularly relevant were physical pain, psychologic discomfort, and handicap. Aims: To conduct a clinical electrophysiologic evaluation of autonomic nervous system functions in patients with burning mouth syndrome and Parkinson disease and estimate the type and intensity of the autonomic dysfunction. Methods: The study involved 83 subjects-33 with burning mouth syndrome, 20 with Parkinson disease, and 30 controls. The BMS group included 27 women and 6 men (median age, 60.0 years), and the Parkinson disease group included 15 women and 5 men (median age, 66.5 years). In the control group, there were 20 women and 10 men (median age, 59.0 years). All patients were subjected to autonomic nervous system testing. In addition to the Low autonomic disorder questionnaire, heart rate variability (HRV), deep breathing (exhalation/inspiration [E/I] ratio), and sympathetic skin response (SSR) tests were performed in all cases. Parametric and nonparametric tests (ANOVA, Kruskal-Wallis, and Scheffe tests) were used in the statistical analysis. Results: The mean values for HRV and E/I ratios were significantly lower in the burning mouth syndrome and Parkinson disease groups. Significant prolongation of SSR latency in the foot was revealed in both burning mouth syndrome and Parkinson disease patients, and lowering of the SSR amplitude occurred in only the Parkinson disease group. The autonomic questionnaire score was significantly higher in burning mouth syndrome and Parkinson disease patients than in the control subjects, with the Parkinson disease group having the highest scores. Conclusion: In patients with burning mouth syndrome, a significant impairment of both the sympathetic and parasympathetic nervous systems was found but sympathetic/parasympathetic balance was preserved. The incidence and intensity of autonomic nervous system dysfunction was similar in patients with burning mouth syndrome and Parkinson disease, which may suggest some similarity in their pathogeneses. King, James Wayne / Bair, Eric / Duggan, Derek / Maixner, William / Khan, Asma A. Aims: To evaluate the relationship between preoperative resting arterial blood pressure and postoperative pain in patients undergoing nonsurgical root canal therapy. Methods: Written informed consent was obtained from normotensive patients seeking treatment for teeth with a preoperative diagnosis of pulpal necrosis and periradicular periodontitis. Preoperative resting blood pressure was recorded, and nonsurgical root canal therapy was initiated using a standardized protocol. Patients recorded their pre- and postoperative pain intensity on a 100-mm visual analog scale (VAS) for 7 days after the procedure. A linear regression model to predict postoperative VAS intensity used preoperative pain and blood pressure values as covariates. Pearson correlations were calculated to assess the relationship between the measures of preoperative blood pressure and both pre- and postoperative pain. Results: After controlling for preoperative pain, significant correlations were observed between preoperative systolic blood pressure and postoperative pain (P < .05), as well as between preoperative pulse pressure and postoperative pain (P < .005) on day 1. Conclusion: This study has provided further evidence of a functional interaction between the cardiovascular and trigeminal pain regulatory systems. Understanding this complex relationship may lead to enhanced pain management strategies. Aims: To study the effect of estrogen deficiency and altered temporomandibular joint loading on the histomorphology of condylar cartilage and on the expression of types II and X collagen and matrix metalloproteinase-3 (MMP-3). Methods: Thirty-six female rats were divided into four groups: ovariectomized rats on a normal diet, nonovariectomized control rats on a normal diet, ovariectomized rats on a soft diet, and nonovariectomized control rats on a soft diet. Ovariectomy was performed at the age of 60 days. Repeated measures ANOVA was used to analyze the data. Results: The condylar cartilage in the ovariectomized normal diet group showed a significantly higher number of cells than in the nonovariectomized control rats (P < .001). The proportional amount of MMP-3 expression was significantly higher in the ovariectomized rats than in the nonovariectomized control rats in both diet groups (P < .001). The area covered by types II and X collagen was significantly higher in the experimental groups than in the control groups (P < .01). Conclusion: Condylar cartilage is sensitive to both estrogen level and dietary loading. Garrett, Filip G. / Hawkins, Jordan L. / Overmyer, Allison E. / Hayden, Joshua B. / Durham, Paul L.
Aims: To test the reliability and validity of a novel rat-holding device designed to be used in conjunction with the plantar test apparatus for studying nocifensive behavioral responses in an established model of temporomandibular joint (TMJ) pathology. Methods: Thirty-five young adult male Sprague-Dawley rats were used. Withdrawal latencies in response to infrared 40 heat stimulation of the submandibular region in naïve animals (n = 4) and animals injected with saline or complete Freund's adjuvant (CFA) in the TMJ (n > 9) were measured over a 2-week time period. Nocifensive responses to mechanical stimulation of the cutaneous tissue directly over the TMJ with von Frey filaments were investigated in animals injected with CFA in the TMJ (n = 6). The effect on nocifensive responses to heat and mechanical stimulation of subcutaneous administration of buprenorphine (0.05 mg/kg) into the hindquarter was assessed in CFA and cotreated animals (n = 6). Statistical analysis was performed using a nonparametric Mann-Whitney U test. Results: Under basal conditions, withdrawal latencies to heat stimulation of the orofacial region remained consistently around 15 seconds over 14 days. Unilateral CFA injection in the TMJ significantly decreased heat-withdrawal latencies on days 1, 2, 7, and 14 in the ipsilateral side (P < .05), but not contralateral side, when compared with basal values. CFA also significantly decreased the nocifensive threshold to mechanical stimulation on days 1, 2, and 7 postinjection (P < .05). CFA-mediated changes in heat withdrawal and mechanical thresholds in the orofacial region were significantly suppressed by subcutaneous administration of buprenorphine into the hindquarter (P < .05). Conclusion: Findings from this study provide evidence to validate the use of this holding device for studying nocifensive behaviors in the orofacial region of rats in response to heat or mechanical orofacial stimulation.